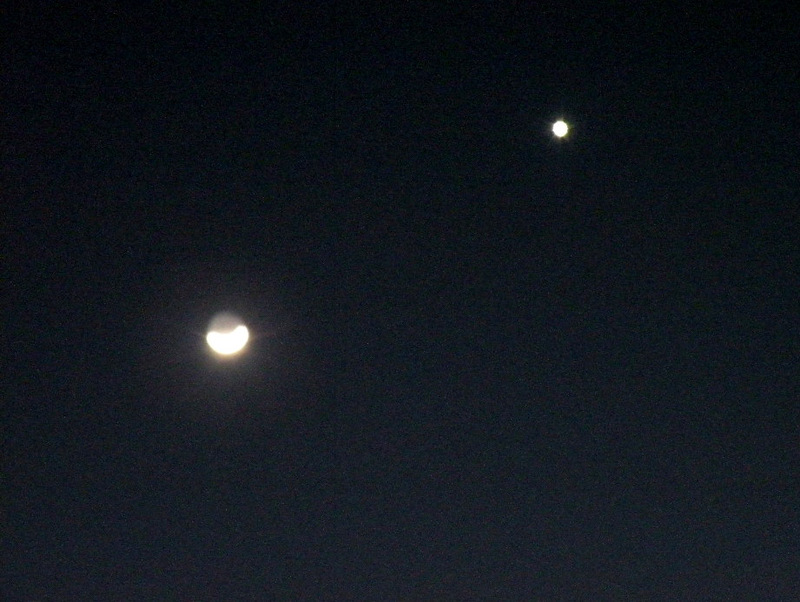 Did you see the Moon dancing with Venus? While enjoying the wonder of this celestial show it is easy to think about how little most of us really know about our Moon and about Venus, or for that matter about our solar system or the Milky Way, our galaxy, or the whole universe. Venus is shrouded in a thick atmosphere consisting mainly of carbon dioxide [96.5%] and Nitrogen [less than 3.5%] with a thick cover of sulfuric acid clouds. which obscures its surface to telescopes viewing natural light. However spacecraft that have orbited or executed flybys of the planet equipped with special filters and instrumentation have been able to map the planet’s surface and learn important facts about it. Thanks to this exploration of space we now know that Venus is undergoing a runaway greenhouse effect where temperature at its surface averages 460 Celsius. We have also learned that despite being almost a twin of the Earth in size Venus lacks an internal dynamo and has no magnetic field that is similar to Earth’s. We expect to gain additional knowledge on the characteristics of Venus when the BepiColombo spacecraft jointly launched by the European Space Agency [ESA] and Japan executes two flybys of the planet on its way to an orbit around Mercury in July of 2014. One thing that appears close to certain is that life, as we know it, appears not to exist in Venus. The same lack of life applies to our Moon, but recent exploration and experiments have confirmed the presence of water ice in permanently shaded crevices inside lunar craters and under the surface in certain regions, which raises the possibility that bacteria or other life forms may have existed or still remain hidden somewhere on our satellite. Where else might there be water and life in our solar system? The image above shows our Sun at the extreme left, followed by Mercury, Venus, Earth, Mars, Jupiter, Saturn etc. in that order. Notice how similar in size Venus and Earth are. Not shown in this view are the numerous satellites, or moons, that orbit many of the planets including the Earth. Some of these moons have been shown to contain water ice and atmospheres, even volcanoes and geysers, which may be conducive for life to exist. So close and yet so far; it is clear we must continue to explore to learn more about other planets in our Solar system, to search for life, and in the process learn more about our own planet and life on Earth. What about other planets, similar to our own, in our Milky Way galaxy? How many are there? Are they rare or are they common? How many of those, if there are any, may harbor some form of life? 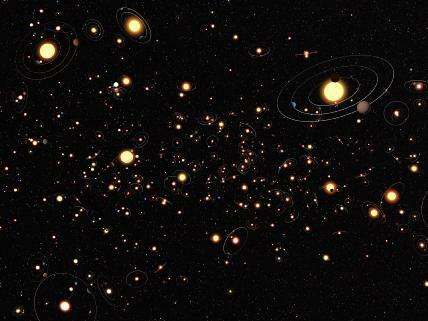 Recent exploration using the Hubble space telescope and other advanced instrumentation and technology have allowed Earth-based scientists to detect the presence of planets orbiting numerous nearby stars. The latest discovery from these efforts is that “terrestrial” type planets, those that are similar to the Earth in relative size, composition and other conditions, appear to be far more common and abundant than the giant, gaseous Jupiter type planets. In fact some studies appear to provide evidence for at least 1,500 terrestrial-type planets orbiting stars within 50 light-years of our Sun, or practically next door to us. These studies have lead scientists to submit this as evidence of the existence of 10 billion terrestrial-type planets in our galaxy alone! What about the millions, if not billions, of other galaxies in the universe? Let us now look back at the images posted here. Is it not truly amazing to look at my photo showing two of our closest neighbors in space, Venus and the Moon, and to see how empty space looks. 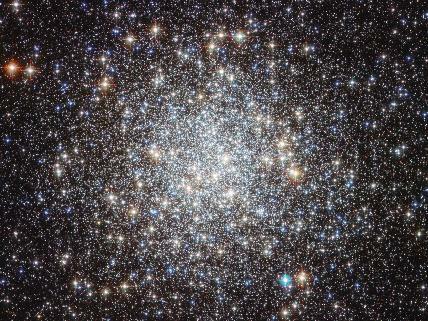 Yet when we are able to zoom past our own ‘neighborhood’ into the space beyond and peer into the realm of our own galaxy as shown in the image of Messier 9 above, what we see is huge multitudes of stars. Related to this, when we hear that emerging scientific evidence appears to indicate planets orbiting stars may be the norm rather than the exception, and furthermore that terrestrial-type planet are preponderant among the population of planets in our galaxy, a picture starts to emerge in my mind at least. A picture of billions of sun-like stars surrounded by hundreds of billions of terrestrial-type planets orbiting around them. A picture that tells me that even if only a fraction of all such terrestrial type-planets happen to reunite conditions to harbor life, whether human-like or of another kind, the probability that there is not only life, but intelligent life, in thousands or even millions of those planets may be quite high in relative terms. In thinking further about this, I wonder in how many of those planets orbiting sun-like stars there are, at this very moment, intelligent live beings looking up in amazement at the sky where Venus-type planets may be engaged in a celestial dance with moon-type objects while wondering about some of the same questions raised here. In closing I would like to challenge all of you, who have taken the time to read this brief posting, to also think that among the billion of other sun-like stars in the universe and billions of terrestrial-type planets, the majority of them are far older than our own Sun and our Earth. What this means is that those intelligent life-forms that may exists on even if it is just a fraction of them may already have had one million, or a hundred million, or a billion or more years to acquire knowledge and to develop science and technology than we have had so far. Just imagine what this means!! What are those immeasurably more advanced intelligent beings capable of doing and thinking? Such is the mystery and infinite magnificence and beauty of God’s creation. The best part of it all is that we as humans are also intelligent and part of this creation, and as such we are capable of contributing to increasing our knowledge for the benefit of all humankind by asking the questions, and seeking the answers, and above all by sharing the knowledge thus acquired.